Dropbox and Chrome have become the two tools I use most. Both services are better and all the options you have, so I always look for new options to further unite these two services, so as to reach EasyDrop, a Chrome extension that allows me to more quickly access my account from Dropbox. As everyone knows Dropbox is the easiest way to store, sync, and, share files online. 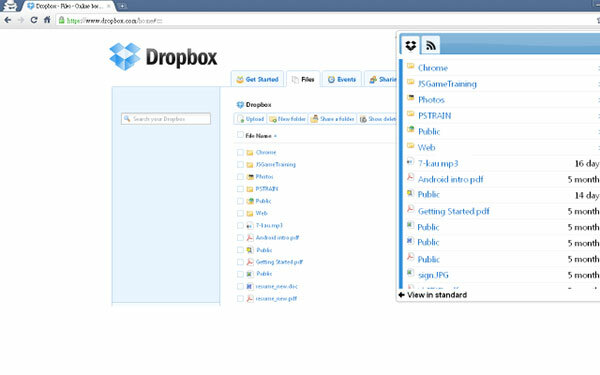 Now you can use EasyDrop widget to access your dropbox account in Chrome! This add-on is a great way to get to your files while working or browsing online. If you are not using DropBox yet, then sign up asap as you can get 16GB of free Storage Space on Dropbox. Thus I can now access Dropbox without leaving Chrome, you just have to install the extension in your browser and see the icon EasyDrop. Now whenever I need a file from my Dropbox account, just click the icon and make all files will appear there. Besides that allows us to search, get links, remove content and expand choices to ¨choosing desktop version ¨. EasyDrop is a well put-together widget. Simple, clean, and effective. I won’t be keeping it since it seems pointless to have another button on my toolbar when the files are already synced to my computer, but this will be my first point of contact if such an extension ever becomes necessary. I think installed it and it really works great. All it needs is an upload option and possibly making it a drop down style menu instead of pop out. Also if you not a DropBox fan then consider reading 10 Best Alternatives to Dropbox. Thus I recommend you to install EasyDrop in your chrome browser, so you can control your Dropbox account without leaving the browser.